So Why Am I Tangling Small Again. 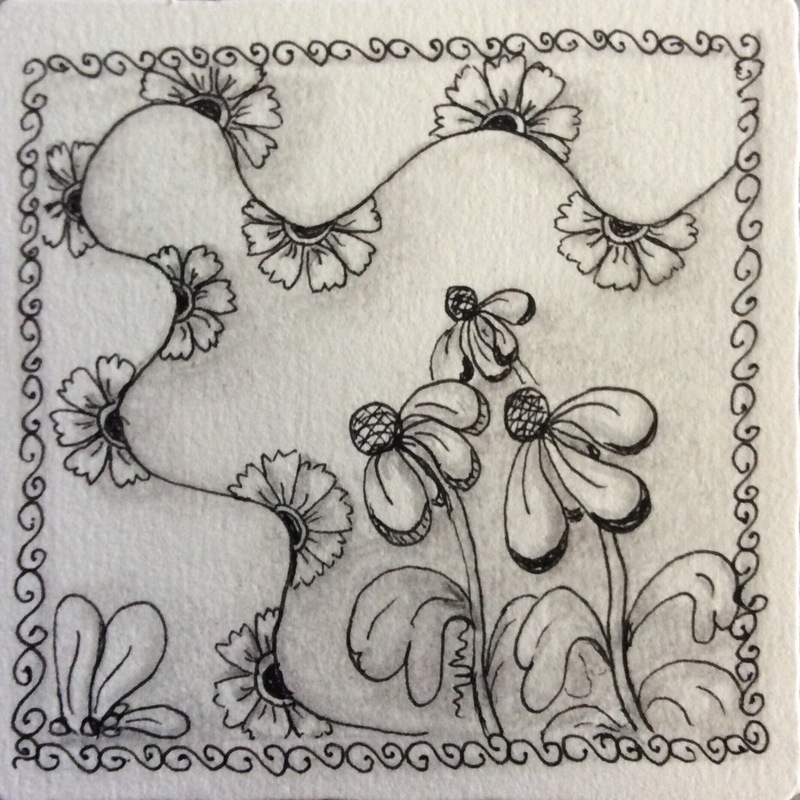 After a slew of back to basics tiles that addressed exercises in the Zentangle Primer, and after doing my best to tangle larger, I drew my first “for fun” tile in what feels like ages! I started with a freehand string drawn in turquoise ink with a Pentel Art Brush. This created thicker strings than I am used to using. 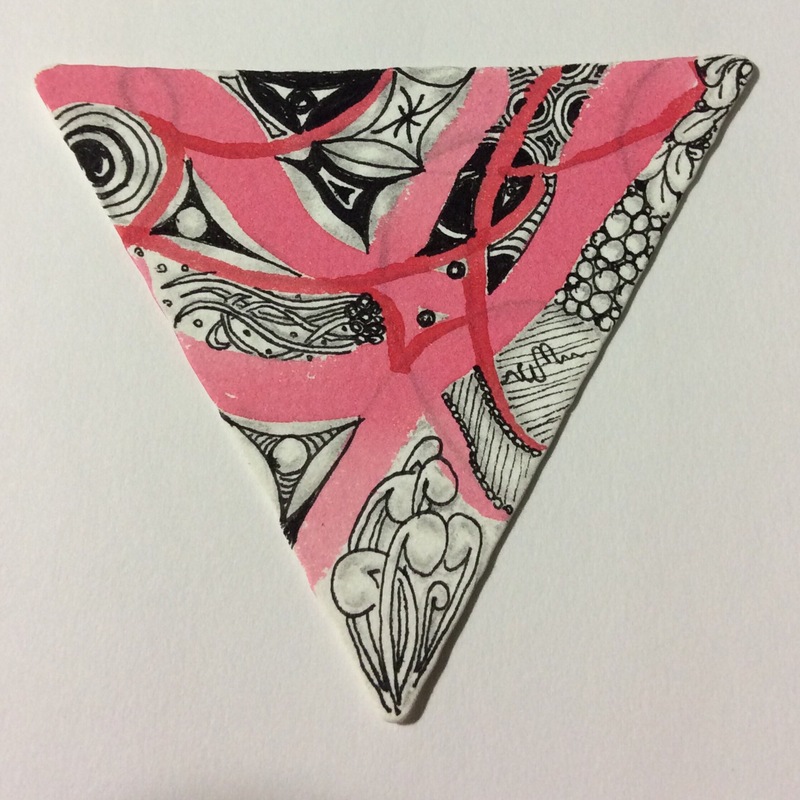 The idea came to me after o used a pre-watercolor-augmented tile for the Valentangle 2017 challenge on Facebook last month. I thought it might be funny. To see where something similar, but in a single tont of a color was used for a string. The freehand and freely drawn string created some marvelous spaces that could be filled with tangles. I started with a miniature Way Bop, filling out the space with Tipple and Msst. Next, I added the Mooka, surrounding it with black space as though it were a silhouette. After adding 2 Flee flowers (like cone flowers or thistle) in the lower center (one is tiny and can barely be made out) and embellishing the area with Queens Crown, I randomly inserted Floo, Flux, a paisley, a favorite triangular Fragment, and those crossing wavey lines at the lower right into the remaining areas. In short, I had a lot of fun working with recently learned patterns as well as older ones in my collection of patterns. The problem: I really did mean to draw larger. I even promised myself the next pattern after the minuscule Way Bop would be big. Well, you can see where that got me. And the rest of the patterns seemed to refuse to tower over the ones already drawn, once more, I was stuck with patterns draw much smaller than intended. Yet, all the patterns look (to me) like they belong where they are and in their drawn size. Amazingly, they seem to go together just as they are. As an experiment, this turned out surprisingly well — if you like this sort of thing, that is. Thankfully, I do like the unexpected. I like the way the turquoise string looks almost like a ribbon tossed on the tile between uses in someone’s hair. The Way Bop could be a rare and exotic tropical starfish-like creature needing a constant stream-like water supply and plenty of pebbles to hid in. The surrounding flowers might thrive on the humidity provided by escaping water vapor. Other sections serve as decoration for the flowers and fish tank. For the past ten days or so, I have been re-visiting patterns I learned early in my Zentangle “career,” but have stopped using. Some fell into disuse because I simply didn’t like them; others because I couldn’t make them work for me; still others for reasons I have forgotten. Using the Zentangle Primer to guide me, I simply started at the beginning. Yesterday, a Primer exercise (#zp1x16) directed me to draw a tangle I either don’t like or have trouble drawing to my satisfaction. I selected a pattern that looks simple but that gives me trouble, ‘nzeppel. 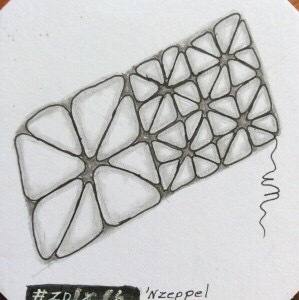 ‘Nzeppel is a simple enough looking pattern that is drawn in a grid of exes. But it has given me a lot of trouble because I can’t get the corners to curve instead of come to a point. This tile shows my best effort in the 10 or 11 months I have “known” it. I posted it on the Zentangle Mosaic app with an explanation, figuring that was the end to it for a while. I was incredibly surprised to learn how many experienced tanglers–individuals whose work is incredibly artistic and beautiful–had difficulty with this pattern as well! Their admission left me feeling so much less klutzy! I am so grateful to them all. Some CTZs offered suggestions (privately) on how to draw ‘nzeppel better–tips that they used themselves. These made me think about the pattern differently. So I redrew it. This is much closer to the effect I was trying to create all these months. It reinforces my feeling that tangling with a group has many significant advantages over tangling alone. Other tanglers can offer advice based on personal experience or contact with other tanglers. It also made me realize that I am not simply having a unique and personal difficulty with a simple pattern. So often, the most complex patterns turn into an easy exercise (my experiences with Way Bop before seeing the step-out, for example), while the simple, easy-looking patterns are challenges for even artistically gifted tanglers. It is such a relief to know that I am not simply an untalented klutz with a pen and pencil. Several of the tips and suggestions I received after uploading the first tile yesterday included references to personal difficulties with the pattern and the tip or instruction that yielded that “Aha!” moment. But it came from group participation and sharing. 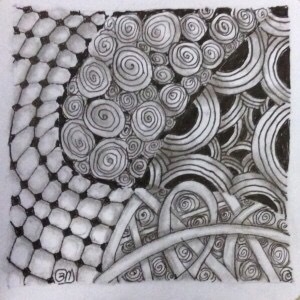 And sharing is just another important aspect of Zentangle. We all get by (and get better!) with a little help from our friends! If you live on the island of St. Martin, in Sint Maarten, or are planning a visit to the island, let’s get together and tangle under a palm tree or beach umbrella by the sea! 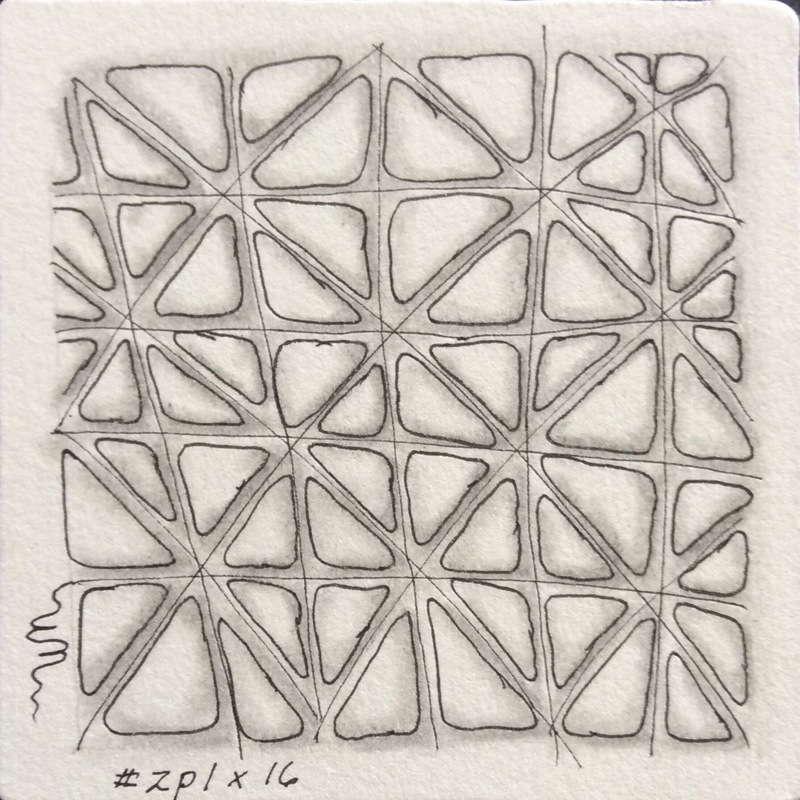 For the past week or so, most of the tiles I created have been based on the earliest lessons of the Zentangle Primer, by Rick Roberts and Maria Thomas, founders of Zentangle. I was feeling overwhelmed with so many new patterns being developed, especially since I have not mastered some favorites I have come across over the past several months. When I feel overwhelmed like this, I go back to the Primer and try to work all the way through again. With each pass through the book, I am reminded of things I have forgotten, things I want to work on improving, and some important suggestions from the authors. Today, I tangled an exercise that made me think. The purpose of the exercise was to draw a string that creates a number of areas, and then to combine some adjacent areas for tangling with a single pattern. Although I now combine areas all the time and without thinking, I forgot how difficult this was for me to do early on. Even though I have done this exercise several times since I purchased the Primer, I suddenly found deliberately combining areas difficult to do. When I tangle with no particular objective, encroaching into an adjacent area with a single tangle simply happens without my thinking about it. When I think about doing it for a purpose–such as for this exercise–I am stymied. For this exercise, I used a few tangles that I learned during my first week or so of tangling, almost a year ago. Except for Florz, I don’t often use these patterns (Knights Bridge, Flukes, Cubine), in part because of the solid black areas that are part of the patterns. There are days when I have trouble staying within the limits of the dark areas because my astigmatism is particularly bad for perception. Instead of filling in areas with color, I tend to substitute fine lines that make the area darker but less dramatic than solid black. So why I chose three patterns with defined black areas is a mystery to me, except that they seemed to go together. But that is what often happens when we tangle–it’s like the pen takes over. When decisions need to be made to fulfill a purpose, pen and mind can come into conflict, and the finished tangle can look a little brittle or forced. That is what happened with this tile, I think. Forcing the blending of two areas made me anxious, and the tension showed up as a conflict among patterns rather than a free mingling. That the realization of how I tangle was brought to the forefront of my thoughts during this exercise shows how flexible the Primer‘s lessons are for tanglers at all stages of tangling development. On the Zentangle Mosaic app, I have seen tanglers–especially CZTs (Certified Zentangle Teachers)–who have been tangling and teaching for years, fall back on lessons from the Primer. The versatility of the book is amazing. New tangles can be found all over the Internet and in books and e-books. But the basics of tangling–the method, process, and purposes–are rarely found outside of the Primer. For me, the Primer has become an essential part of my tangling–from providing inspiration when I feel stuck, to reminding me about sticking points for my early tangling attempts and current needs. Right now, it is helping me get back to basics so I can get over feeling overwhelmed by a deluge of new patterns. Next, I will try this exercise again using new patterns I have learned recently. There is always a new way to interpret an old lesson! Today I started making a conscious effort to draw bigger. One of the many pieces of advice found in the book Zentangle Primer is to draw patterns large. When certain patterns are drawn large, other patterns can be drawn inside. Patterns that are larger also require more control and focus, and fill up a tile faster. A single pattern drawn very large can serve as the tile’s string. When I get caught up in tangling, I tend to draw my patterns small. Consequently, my tiles turn out darker than I like. Sometimes, they take on a cluttered appearance. Too often, my tiles take a very long time to draw, sometimes making the mediation almost tedious, detracting from the intended relaxation. Thankfully, tedium rarely happens. This morning, I tangled larger than usual for most of the piece. It went faster and resulted in an airier-looking tangle. The border was added last and was drawn along the outside of the original boundaries, without “straightening out,” to give the piece a more spontaneous feel. Although I need to tangle still larger, this is a step in the right direction. 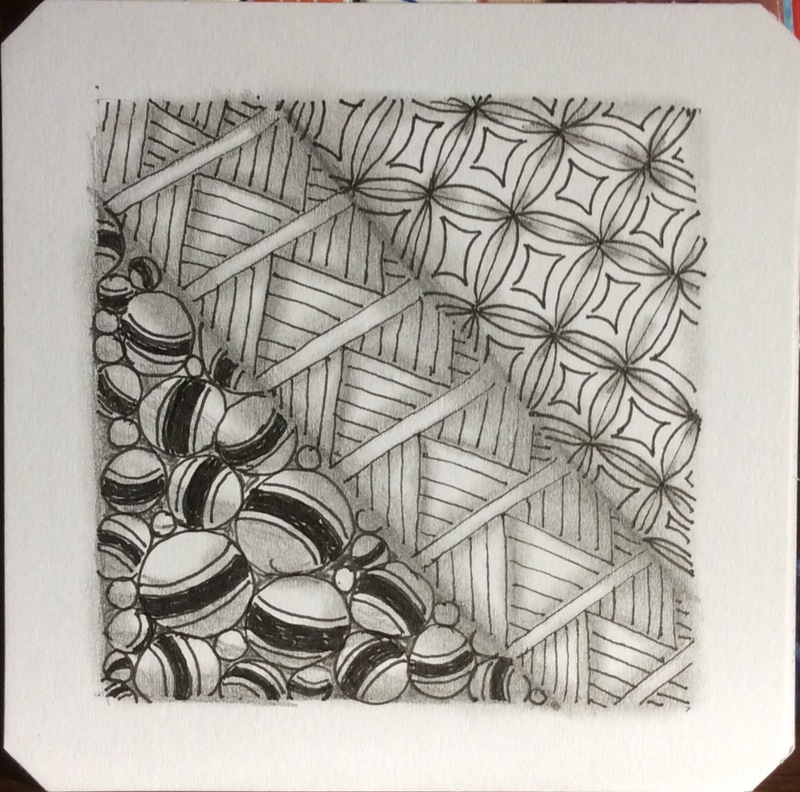 The 8-step Zentangle meditation took far less time than my usual tiles (20 minutes compared with my average hour or so), and, surprisingly, left me feeling more refreshed. Patterns used in this tile are Henna Drum (the bachelors button looking half-round) and Flee (the cone-flower-like pattern in the bottom right area). Along the outside of the original pencil border, I added a chain of Scoodle elements. The pattern Flee, drawn even bigger, allows enough space within the pattern to fill leaves and petals with additional tangles. Here, although I left the petals alone, I filled the leaves with the Printemps pattern to give them texture. The Printemps was drawn with the 2B graphite drawing pencil recommended for shading. The leaves were drawn with the Micron 05 pen, which creates a line about twice as thick as the Micron 01 pen. The texture would be richer drawn with the Micron 01, or somewhere in between if I had used a Micron 005 instead of graphite. The same or different pattern (or several patterns) could have been used to fill in the petals for a totally different effect. In the last tile, the pattern Flee serves as the string for tangling other patterns in the spaces created by petals and leaves. Drawing a pattern very big on your tile can give you a lot more options, especially if inspiration is not coming. Each drawing size yields different possibilities. Those possibilities are endless! Tangle, relax, set imagination free, explore your creativity! 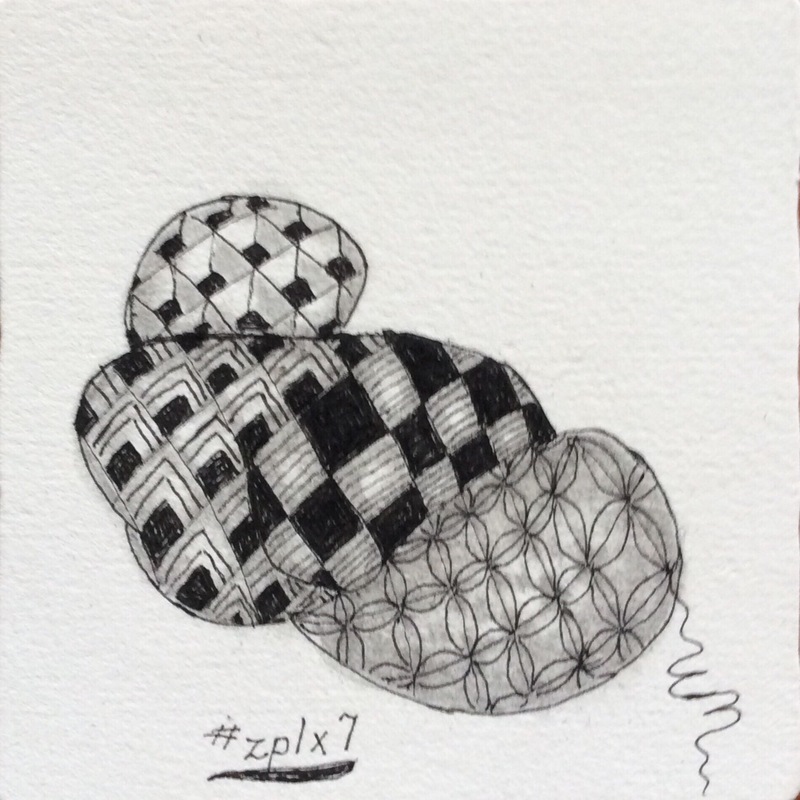 About ten months ago, I came across Zentangle as I was researching forms of meditation, especially those I could somehow learn on my own. I had recently lost my mother, and I felt life imploding on me even though we had not been as close as we once were. Being still is more than difficult for me–it is impossible. I have more than a touch of Attention Deficeit Disorder (ADD) and need to move or be doing something if I want to concentrate. So most meditative methods seem to be out for me. I had thought about Tai Chi, but I live on a tiny island, where offerings are few. 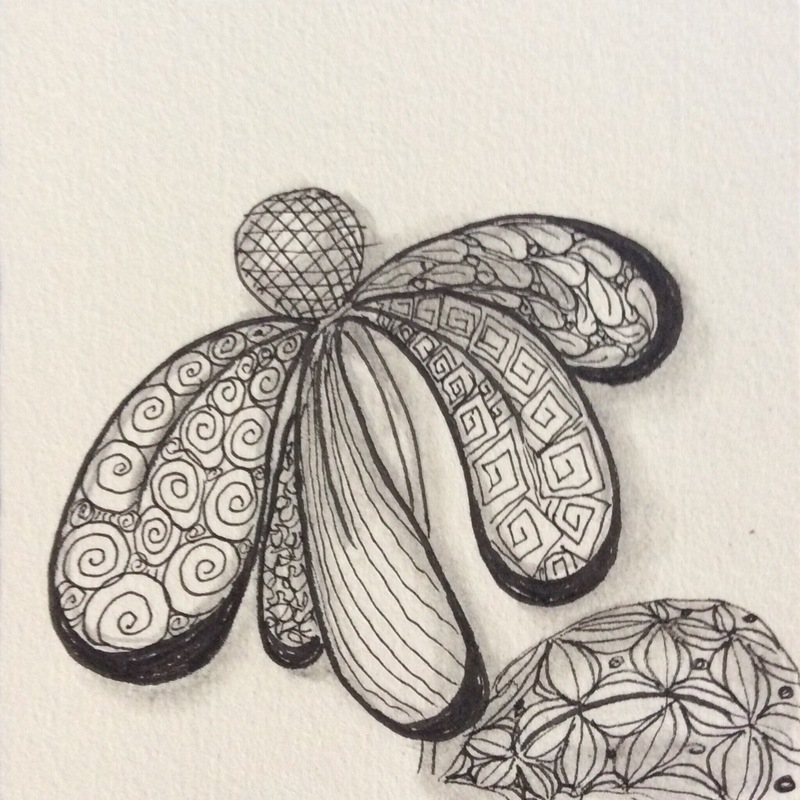 Then I came across Zentangle, and got interested in the idea of meditating through repetitive drawing of patterns. A Primer Lesson 1 tangle from my files. No one will ever accuse me of having even the slightest artistic talents. I took drawing lessons a few years back to learn perspective and techniques; the lessons helped, but talent was clearly lacking. So Zentangle’s claim that artistic abilities were not necessary intrigued me. I had to learn more. According to the official web site, Zentangle.com, the best way to learn the Zentangle method is to attend classes offered by a Certified Zentangle Teacher (CZT) in my area. Well, the island of St. Martin in the Caribbean Sea is small, and Zentangle hasn’t made it this far. I live in Sint Maarten, the Dutch country on this tiny island. The French side has a slightly smaller population. Even between the two countries, the total population is barely that of a small town back in the States. It is not surprising that there are no CZTs here, even though there are plenty of them in the Netherlands. Clearly, I would be on my own. The second best method of learning to tangle, according to the web, is to purchase the official book. Instead, I bought a copy of a book called One Zentangle a Day, basing my purchase decision on the far lower cost compared with that of the official Zentangle Primer. I ordered One Zentangle from Amazon, along with the recommended pen, 3.5-inch square artist tiles, tortillions, and 2B pencils. Once I had everything together, i started experiencing Zentangle. Each day, I poured my morning coffee and got out my book. Often, it took me longer than a day to complete a lesson, as I found myself getting frustrated with my apparent inability to draw even the simplest shapes and patterns. Clearly, I was doing something wrong, as I was not getting the expected benefits. As I “meditatively” journaled my journey into tangling on my writing blog (Write of Passage)–or maybe I was critiquing?–I began to notice a change in my attitude toward the process. It was actually working! As I tangled my way through the book, I kept reading up on Zentangle. Finally, I broke down and purchased the official Zentangle Primer: volume 1 from the web site. Before making this purchase, I bought several e-books on tangling, and even a set of workbook-like books. By then, I had spent close to 4 times the cost of the Primer. As it turned out, The Primer is all I really needed! 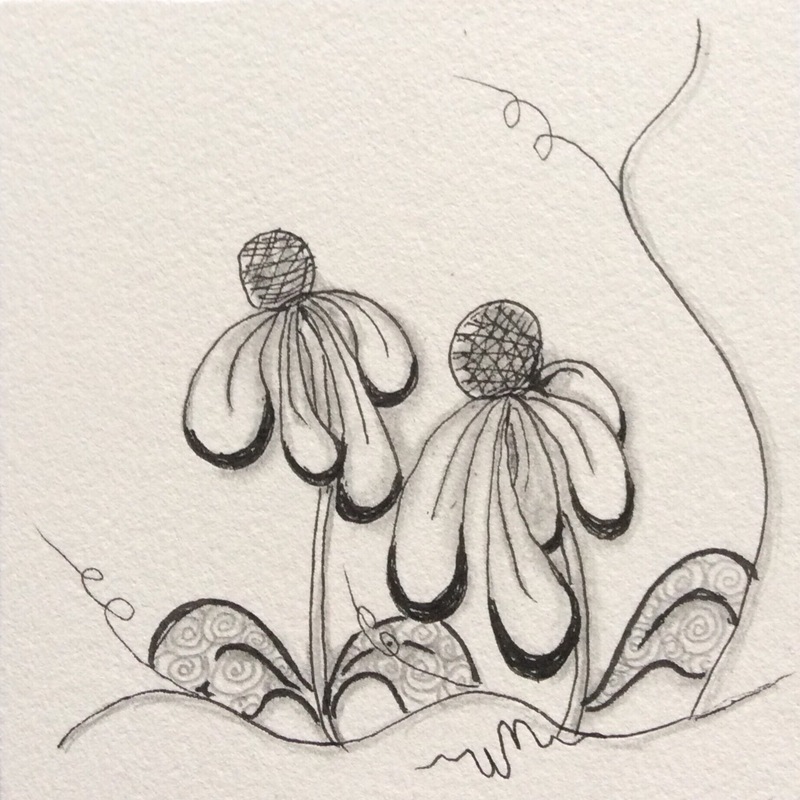 The Zentangle method and philosophy is clearly laid out, including the celebratory nature of The Zentangle method and process. The reasoning behind the steps of the method is clearly defined, beginning patterns are illustrated as “step-outs” (which provide breakdowns of drawing even some very complex patterns! ), and easy to follow lessons provide a framework for drawing. Even methods of shading and highlighting are included to add depth and dimension to basically flat drawings. Patterns, as presented, progress logically so that elements and methods from an earlier pattern are clearly evident in patterns of greater complexity. Best of all, entire charts of “fragments” to be used in rectangular, triangular, and circular grid spaces provide ideas and jumping off points for working on one’s own–including development of one’s own patterns and fragments. Everything a beginner needs to get started correctly is in the Primer, and web sites for inspiration and more advanced patterns are listed for the adventurists. My work is not fancy, although I have learned to experiment with different materials and media for an occasional artistic touch. Tangles who understand the Zentangle method and process see the work for what it is and are not influenced by fancy patterns and flashy colors. That’s not to say fancy tiles have no place; it’s just that the simple process, simple tools, and simple black ink reduce the process to its essential elements–simple, controlled, relaxing, meditative strokes. The Zentangle motto is “Anything is possible one stroke at a time.” The products of advanced tanglers attests to the creative processes released by this clean and simple methodology. At this point, I have been tangling for ten months, and using the Primer for about half that time. When I need to touch base with my center or need to relax, I reach for a tile, my Micron pen, my 2B pencil, and a torillon. I go through the eight steps discussed in two previous posts. And I begin to lose myself in the process of Zentangle. I don’t have to be home to tangle, and the small size and simple tools are so portable that a “kit” can be carried easily in a pocket or bag so I can tangle anywhere. As I tangle, thoughts pass through my mind. As in any meditation, some are let go, others are contemplated while part of my mind focuses on drawing a pattern or two. Sometimes, I need to tangle more than one tile to get full benefit. Sometimes I lose concentration and need to set a tile aside. Sometimes, an “artsy” inspiration comes to me for later or immediate attention. Each time I create something new. Each time, I learn something new about the process, pattern manipulation, or myself. When I make a mistake, I incorporate it into the process and move on. 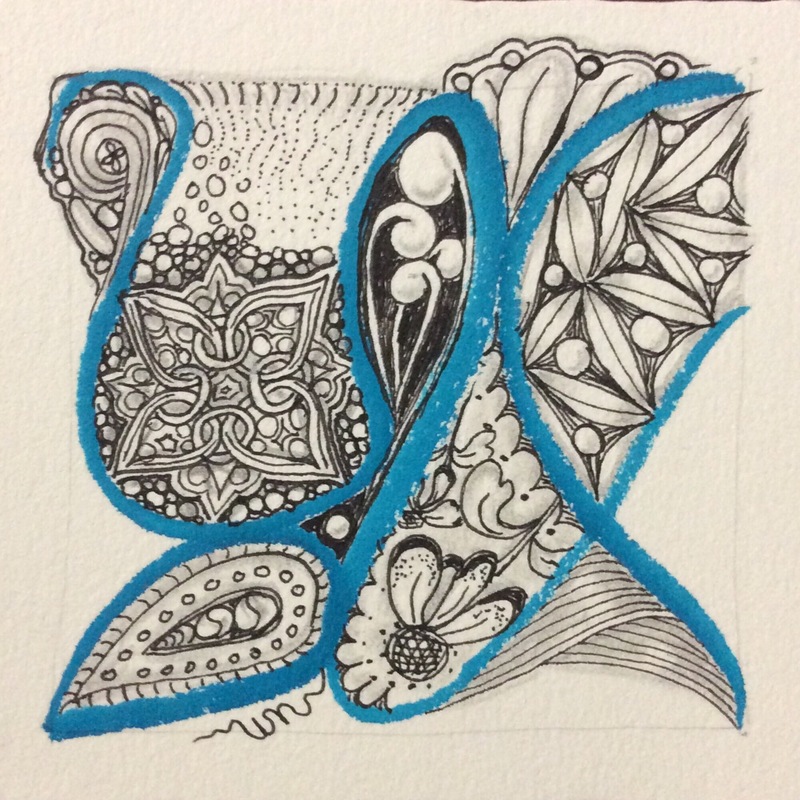 In Zentangle, there are no mistakes, only opportunities–for growth, for change, for coping, for living, for learning. Simple tools, simple process, celebratory appreciation, meditation–all while producing a miniature work of art. That is why I tangle.